While some refer to it as the old drunk uncle of web hosting, Dot5Hosting offers a one-size-fits-all approach to web hosting in that they only have one hosting plan option (not the smartest business move). They focus on providing hosting to individuals and business owners that are looking for web hosting that will fit their budget. We don’t think it’s the most compelling host out there, but keep reading to learn more about how Dot5Hosting stacks up to the competition. Dot5Hosting is an experienced hosting company that is looking to provide hosting to everyday users that are looking to get more bang for their buck. They have just one unlimited plan that they offer to their clients that comes packed with extras along with their money back guarantee. They have 24/7 customer support but do not take advantage of the power of social media for helping customers. This hosting may or may not work well for your particular needs. Let’s be honest – Dot5Hosting is still trying to catch up to the modern era. Their site is still stuck in the early 00’s (like 2002). I don’t know their whole history, but I’m pretty sure they haven’t changed too much. If you’re the type of guy or gal that likes something good enough, hey Dot5Hosting may be the way to go. It’s like your old unmarried uncle who sticks with the same cheap liquor from the corner store for his daily drink – it’s good enough for Uncle Hal, so why change? Dot5Hosting has a target market of individuals and business owners who need to fit their web hosting in a smaller budget than most corporations are able to have on tap, and still compete with better-funded websites. Wonder how well they do? Continue reading to find out more about them. This is an editorial review based on reviews and ratings of Dot5Hosting available online. Be sure when you go to make your final decision that you read over what users are saying about this service, and examine their website for more information to make an educated decision. Dot5Hosting has a pretty stable history considering that it has been in business since 2002. It was acquired by EIG in 2007 (who also owns Bluehost and HostGator). 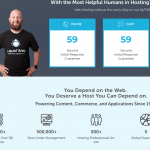 Going with Dot5Hosting as your web host will grant you a whole bunch of extras that will benefit you and your business. These include a domain name, Google Adwords credit, Yahoo credits, shopping carts, constant contact email marketing, site builder, templates, and many other features. They offer a money-back guarantee if you are not satisfied with their web hosting service during the first 30 days. They will refund your hosting fees, but only if you paid with a credit card. If you want to keep your domain name that you registered with them for free, you will need to pay 15 dollars to keep it. This money-back guarantee gives you a longer period to determine whether or not you are happy with the service. The fact that they offer a one size fits all plan is good, but it can also be bad depending on what you are looking to get out of your web hosting experience. Their one year plan is typically a little under 13 dollars a month, and their two-year plan is typically under 12 dollars a month, but they do run promotional prices to introduce you to their service. 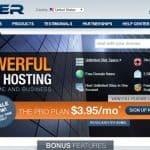 There’s current a special offering the hosting for just $5.95 to start. There are many unlimited features offered under Dot5Hosting that can make this hosting service worth another glance. This includes disk storage, ability to host unlimited domains, POP3 email boxes, MySQL databases, parked domains, subdomains, autoresponders, and forwarding email accounts. You can reach customer support through a toll-free phone number or by using the help desk to send support tickets. The phone option is only available to clients in the United States. They also offer a knowledgebase and user guides in the help center if you are interested in learning more about web hosting. Dot5Hosting uses vDeck rather than cPanel, and some users may find that this does not have the same functionality. It may also be less easy on the eyes when it comes to getting used to it. I took a look and it is actually different from a standard cPanel interface. Beginners don’t care, but experts may want the standard approach. They do have a termination charge if you want to close your account before the plan term you picked is up unless you are cancelling within the money-back guarantee period. There are no specifics on the website offering information on their uptime/downtime. There do not seem to be too many complaints regarding this issue, but having as much information as possible is always good for making educated decisions on which services to choose. Many companies are offering support through social media, so it is a bit of a downside that although they have a social media presence, they are not really utilizing as much as they could be compared to their competitors. When I don’t see social media, I think – ok this company isn’t even trying. It’s a sign that they don’t have their ducks in a row so I would avoid companies like that. Listen, maybe you have a friend with an old Dot5Hosting account and he’s like “it’s great I have no problems” – well he doesn’t know much about hosting OR he’s a developer and can fix problems on his own. We view Dot5Hosting as a dinosaur that hasn’t changed, and is just rotting away. Their user base has been dwindling (according to 3rd party data) and they don’t seem to be doing much. If you wanna go with them, that’s fine. But if you want a modern, updated host, go with something like SiteGround, WP Engine, or another EIG-owned brand like HostGator. You’ll be a lot better off that way. Go compare some companies like Bluehost vs HostGator or SiteGround vs WP Engine before you make up your mind. 3/22/18 – New bottom line written, new bullet points in intro with pros and cons, a few other small changes.